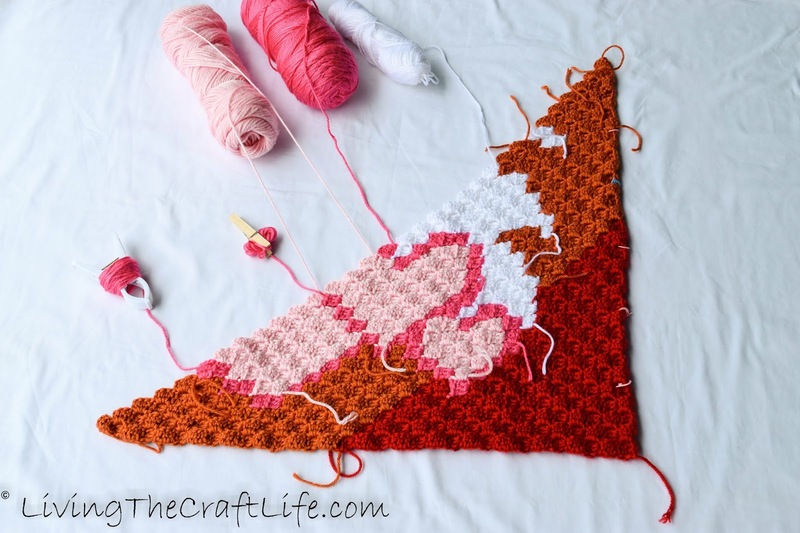 I found this super cute C2C pattern that I thought my daughter would really enjoy! I have never done a C2C (or corner-to-corner) crochet project before. I was excited also to participate in a crochet along, or CAL for short. This was a C2C CAL by HeartSprinkle! How adorable! It was super fun anticipating the beginning of the project. I started looking up how to do the C2C stitch, watched a few videos and I was on my way! I had trouble sourcing the right colors. Many of you know how much I love Caron Simply Soft yarn, but it was very difficult to find the rainbow of colors in the right shades, and I had to settle for some less-than-ideal shades. I did NOT want to use Red Heart Yarn for such a beautiful project! I knew it would still turn out fantastic and that my girls would love how it looked. 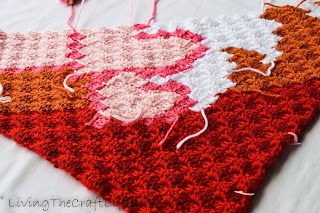 Because I was already working on the Flower Puddles Blanket, I desperately wanted to finish that one first. I only had a few rounds left! But then when I thought I finished the blanket, I realized I added extra stitches to the second half of the last row, so I had to frog it and redo it. that made me lose some time on the CAL! But, Alas! I have finally finished the first week of the CAL and they are starting the 3rd week. Now that I've finished my Flower Puddles Blanket, I'll be able to commit more fully to the CAL and hopefully catch up this week or next! Here is the photo of my week 1 progress! I love the way the stitch turned out!